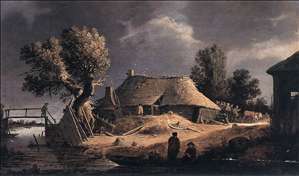 Dutch landscape and genre painter active in his native Rotterdam. He specialized in countryside views and peasant subjects, such as Drunken Peasants Fighting (Muzeum Narodowe, Poznan) and Dancing in a Tavern (Szpmvszeti Mzeum, Budapest). 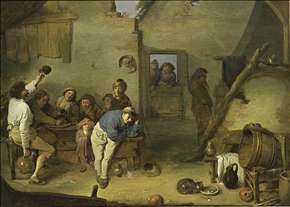 His tavern scenes have some affinity to those by Adriaen Brouwer. 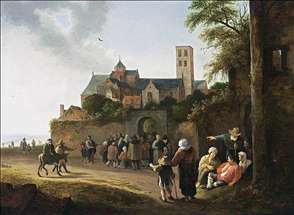 Jan van Goyen influenced his landscapes but has more figures and is richer in narrative detail. He also painted religious subjects. St Martin and the Beggar (Victoria and Albert Museum, London) shows the saint cutting his cloak in half to share it with a beggar at Amiens; a crowd of crippled beggars witnesses the scene. 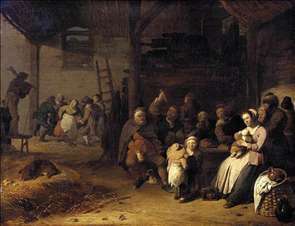 One of his early interior scenes, In the Lawyer s Office (1628, Rijksmuseum, Amsterdam), is an interesting record of such an establishment in 17th-century Holland, humorous in its depiction of clients queuing at the counters with children and dogs. See more details about "Barn Interior"
See more details about "The Mariakerk in Utrecht"
See more details about "Tavern Interior"